It's 1958, and here's Bill Meeks in PAMS' first real studio which was located on Knox Street. Note the egg crates attached to the wall for acoustical treatment! Bill described this studio as "purely a cut and saw method. You'd try one thing and that was wrong, then you'd try something else... We kept trying everything in the world and we kept improving." 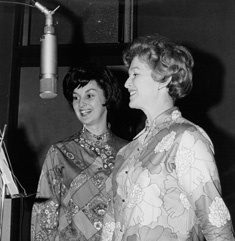 Claire Stewart was the lead singer for the PAMS vocal group in the late 1950s and early '60s. She did several memorable solos in Series 15 ("Are you constantly on the go, trying to improve your status quo?") and Series 16 ("I Had A Ball in Big D"). 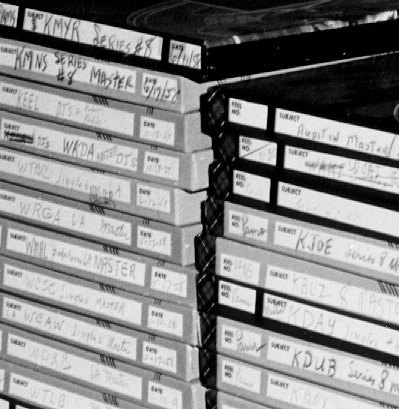 Here she is adding the master tape of another completed package to the PAMS tape library. There's a great bonus for jingle historians in that photo of Claire. With enough enlargement you can actually read what's written on every one of those tape boxes! Most of the packages in this small excerpt are from the summer of 1958. The big sellers appear to be Series 8, 6, and 3. 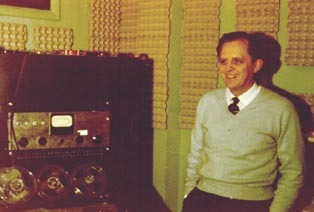 Left: Euel Box wrote hundreds of PAMS' best known jingles. He came to PAMS in 1957 and was Vice President of Production during the '60s. His son Alan was a salesman for PAMS in the early 70s. 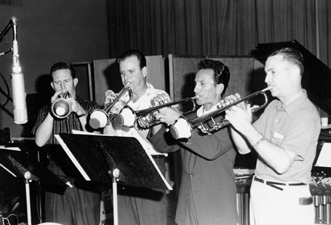 Right: In addition to being a writer and arranger, Euel also played the trumpet on many PAMS tracks (he's on the left side). Many PAMS jingles rely on unusual percussion sounds and patterns. Today, one percussionist might build these effects by recording one instrument at a time on several different tape tracks. But in the days of 2- and 3-track recording, almost everything had to be performed simultaneously. 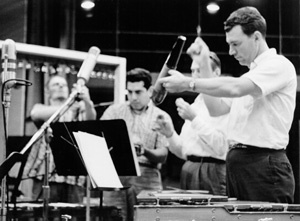 Here you see four PAMS musicians, each with a different instrument, gathered around a microphone to create the percussion effect for a new jingle. 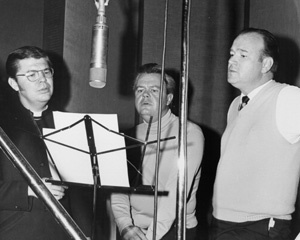 (from left to right:) Dan Alexander, Jodie Lyons, Bob Piper, Carol Piper and Terry Lea Jenkins sing a new PAMS Country package in 1967. 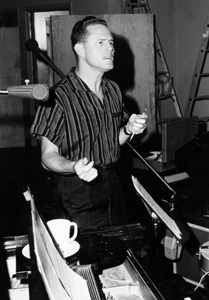 Terry Lea was the lead singer and soloist on many early PAMS series such as 6 and 8. 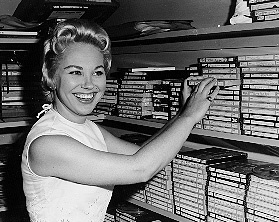 She also sang the "My Home Town" song, which was released as a record in many cities. Carol sang in the group for many years, and was the lead singer of the 7-voice group in the mid-70s. Too bad this wasn't a color photo so that we could really appreciate the ladies' trendy dresses! Photos on this page are from the private collection of Bill and Marjorie Meeks. Rights to all photos are reserved by their respective owners.